Is that a bunch of keys in your pocket or are you just happy to see us? You know, that huge ring of keys you stubbornly jam into your jeans pocket every day isn’t attractive and it’s kind of dangerous. But for this problem, just like for most other problems, there’s a solution that can not only make your life easier but substantially increase your geek cred. 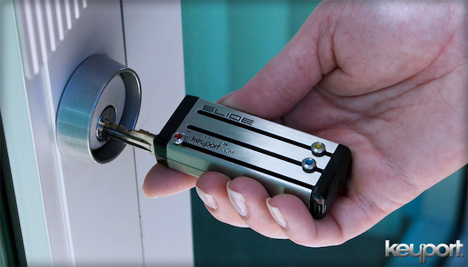 Keyport is a snazzy little gadget that eliminates the keyring full of sharp, pointy keys and replaces it with a sleek metal box that holds up to six keys. 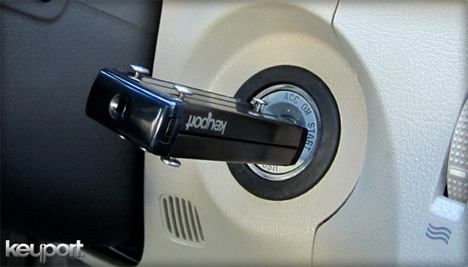 Gone are the traditional key heads, replaced with simple key “blades” that slide out when you need them. If you don’t have six keys to replace or just want to up the geek quotient a little, you can substitute other inserts for some of the keys. We particularly dig the slide-out flash drive, but you also have a choice between an LED flashlight, bottle opener and store rewards cards. Of course, the metal box of keys in your pocket won’t actually cut down on much bulk, but at least you’ll stop jingling when you walk.